The Venus system is a way of life. But what happens when you need to make quick changes to your physique for a special occasion? 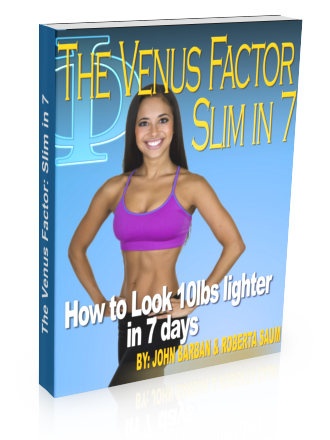 We're here to help with the Venus Factor Slim in Seven: our magic formula protocol for amazing results in one week. Want to feel and look your best at that party, wedding or other special event? Are there going to be photographs taken (or even video footage)? Social media makes it so easy for guests to pubish photos and video clips (and tag you in them!) You want to be confident that any photo taken of you, from any angle, will look great. Roberta Saum and John Barban have designed this step-by-step manual to provide you with everything you need to tighten up in just seven days. The system is based on the approach fitness competitors and physique athletes use for competitions and photoshoots. John and Roberta have discarded the practices they know aren't worth it, and have added in little-known tips and tricks which will work for you. It's all here: from meal timing and water manipulation, to posing secrets and exactly what to do in the final 24 hours. We'll guide you through every detail of nutrition, workouts and final preparation for a full seven days (with your event falling on the eighth day). Unlock the secrets of the Slim in Seven protocol now and get started right away. We've got it covered.